I ran the following scripts with no errors but the example fails with ‘Error: imported global env:__ZNSt3__14cerrE must be a number’. I have tried running other examples and they have failed with the same errors. just tested and this is working for me without problem. 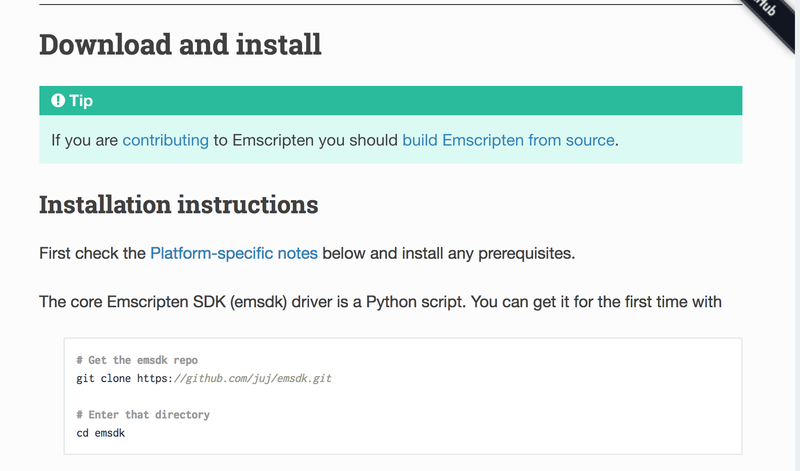 The only thing i see is that you are downloading emscripten from a weird server that doesn’t seem to be the official. These were the directions i was following. Where are the instructions you were referring to? oh yeah sorry. they might have changed the repo recently and i wasn’t recognizing the address. any pointers on which older version of what combined will work!? @arturo are you able to compile this inside docker? If so can you please share instructions for doing so. Thanks! Has anyone here been able to resolve the issue? Has anyone solved this problem yet? I have the same issues. No, not yet. I’ll look at it in mid february and open a bug report if I can’t resolve it.